The Great Red Spot, a storm larger than the Earth and powerful enough to tear apart smaller storms that get drawn into it, is one of the most recognizable features in Jupiter's atmosphere and the entire solar system. The counterclockwise-moving storm, an anticyclone, boasts wind speeds as high as 300 miles per hour. This prominent feature, observed since 1830, and possibly as far back as the 1660s, has long been a source of great fascination and scientific study. 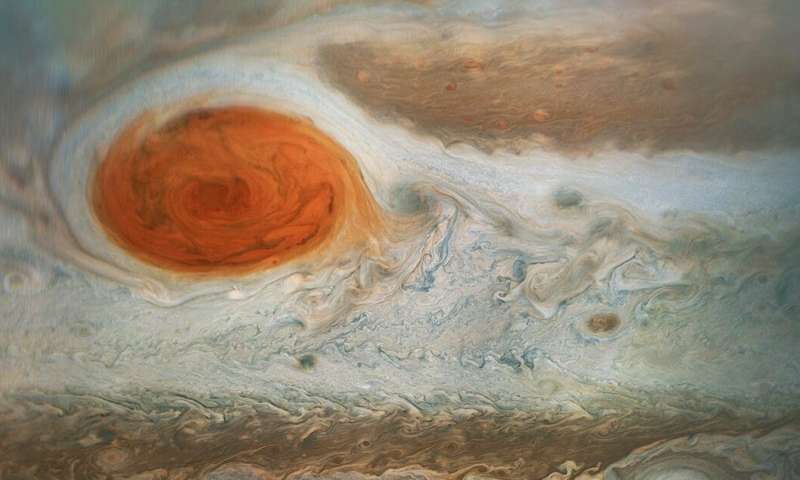 Much about the Great Red Spot is still unknown, including exactly when and how it formed, what gives it its striking red color and why it has persisted for so much longer than other storms that have been observed in the atmosphere of Jupiter. 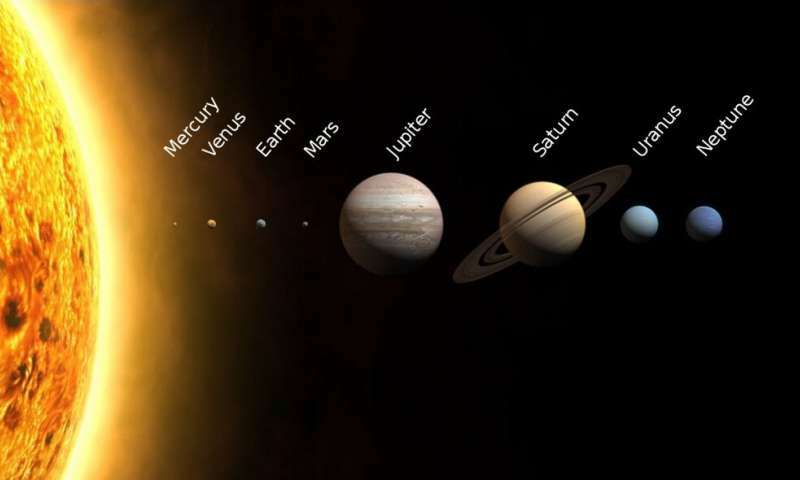 However, astronomers think that its position in latitude, consistently observed to be 22 degrees south of Jupiter's equator, is connected to the prominent cloud bands in Jupiter's atmosphere. As a planetary astronomer who studies the atmospheres of comets, I'm normally not investigating massive storms. But I still want to know about the features seen in the atmosphere of other bodies in the solar system, including Jupiter. Studying atmospheres of all kinds deepens our understanding of how they form and work. Unlike Jupiter, the Earth has land masses that cause major storms to lose energy due to friction with a solid surface. Without this feature, Jupiter's storms are more long-lasting. However, the Great Red Spot is long-lived, even by Jupiter standards. Researchers don't quite understand why, but we do know that Jupiter's storms that are located in cloud bands with the same direction of rotation tend to be longer lasting. These colorful alternating bands, called belts (dark bands) and zones (light bands), run parallel to Jupiter's equator. Researchers aren't sure what causes the coloration of the bands and zones, but differences in their chemical composition, temperature and transparency of the atmosphere to light have all been suggested as contributing factors. These bands are also counter-rotating, meaning that they move in opposite directions with respect to their neighbors. The boundaries between the bands and zones are marked by strong winds called zonal jets. The Great Red Spot is confined by an eastward jet to its north and a westward jet to its south, confining the storm to a constant latitude. However, the Great Red Spot has undergone considerable changes in longitude over time, and recent evidence suggests that its rate of westward longitudinal motion is increasing. Like the Great Red Spot, the bands have undergone little change in latitude over the time during which they have been observed. Researchersdon't entirely understand the banded structure, but we do have evidence suggesting that the light colored zones are regions of rising material, and the dark belts are regions of material sinking into the atmosphere. On Earth, there is a well-defined boundary between the atmosphere and the surface of the planet, which is largely covered by liquid water. However, there are no known large oceans of water under Jupiter's clouds. Based on what researchers do know, the atmosphere smoothly transitions to a liquid hydrogen interior within the planet. There may be a solid core to Jupiter, but it is most likely buried very deep under a thick layer of liquid metallic hydrogen, a form of hydrogen that acts as an electrical conductor. What else do we know about the Great Red Spot that is changing dramatically? Its size, shape and color. An analysis of historical and recently obtained data on the Great Red Spot has shown that it is shrinking and becoming both rounder and taller, and its color has also varied over time. What is driving these changes, and what do they mean for the future of the Great Red Spot? Researchers aren't sure. However, NASA's Juno spacecraft, currently orbiting Jupiter, is gathering more data on the cloud bands and the Great Red Spot. These new data will likely provide insights into many of the features in Jupiter's atmosphere.